Paperback, 5.5 x 8.25 in. / 950 pgs. Edited by Charles Arsène-Henry, Shumon Basar, Karen Marta. 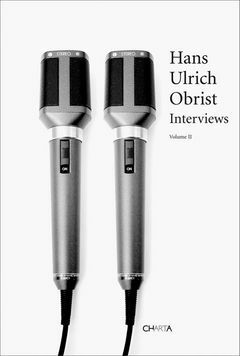 Since Hans Ulrich Obrist--museum director, curator, writer, cultural instigator and professional conversationalist--released his bestselling first volume of interviews back in 2004, one wonders if there is a living artist, musician or writer left with whom Obrist hasn't recorded an interview. Happily, of course, there are plenty. Obrist--who was born in Zurich in 1968, and who joined London's Serpentine Gallery as Co-Director of Exhibitions and Programmes and Director of International Projects in 2006--makes it his business to cross paths with the most significant thinkers of our time, from in or outside the artworld. Since 1993, he has conducted literally hundreds of interviews. The 70 published here are taken from an archive containing nearly 2,000 hours of recordings and organized by interviewees' dates of birth. Volume 2 is another collection of insightful dialogues with a diverse group of architects, artists, filmmakers, historians, musicians, philosophers and writers--including Björk, Miranda July, Studs Terkel, Czeslaw Milosz, Alejandro Jodorowsky, Emmett Williams, Merce Cunningham, Richard Hamilton, Doris Lessing, Beno"t Mandelbrot, Kazuo Shinohara, Jacques Herzog, Ai Wei Wei, Arto Lindsay and Michel Houellebecq-- a rich trove of international cultural thought spanning the past 100 years. Encyclopedic in scope but intimate in tone, these exchanges provoke unexpected torrents of biographical trajectories, theoretical adventurings and inklings of projects to come. "Hans (who I always think of as HUO) is one of the few people who know what a true interview ought to accomplish, and he has an amazing knack for getting to the essence of a person. He's the press equivalent of laser eye surgery. With HUO you never get to the twenty-first minute, and with HUO you feel like you’ve had a conversation. He does it the old fashioned way, in person, with a microphone, transcribing the results. This second volume of HUO's interviews is more diverse than his first, and reflects a broader span of voices and points of view. Each person is a person, and each person is unique. This is a difficult feat to accomplish." Douglas Couplan, excerpted from On Interviews in Interviews, Volume 2. FORMAT: Pbk, 5.5 x 8.25 in. / 950 pgs.